I am interested in the role that mantle exhumation and serpentinization has on tectonic and geochemical processes. I use (U-Th)/He thermochronology and trace element geochemistry to 1) date magnetite that form during fluid alteration, 2) investigate the geochemical fingerprints of serpentinization at different tectonic settings, and 3) constrain the thermal history of ophiolites. My other work includes using (U-Th)/He techniques to study island arc exhumation and erosion, using a new sample set collected on a GEOPRISMS expedition to the Aleutians in 2015. Benchmark studies demonstrated that magnetite (U-Th)/He chronometry can be used to date volcanic and ore rocks. I have tailored a method to date magnetite grains that form during serpentinization, the hydrous alteration of peridotite. This process has given me experience with a number of analytical techniques including X-Ray Computed Tomography, Scanning Electron Microscopy, QMS, and ICP-MS.
Serpentinites are found in relation to all types of plate boundaries. The timing of serpentinization, however, has been challenging to determine due to a lack of minerals with established dating techniques. My approach is to use magnetite and spinel to date serpentinites from a variety of tectonic environments. My field areas include the hyper-extended margin settings in the Swiss Alps and the Iberia-Newfoundland margin, an exhumed subduction complex in Syros, Greece, and the Oman ophiolite. 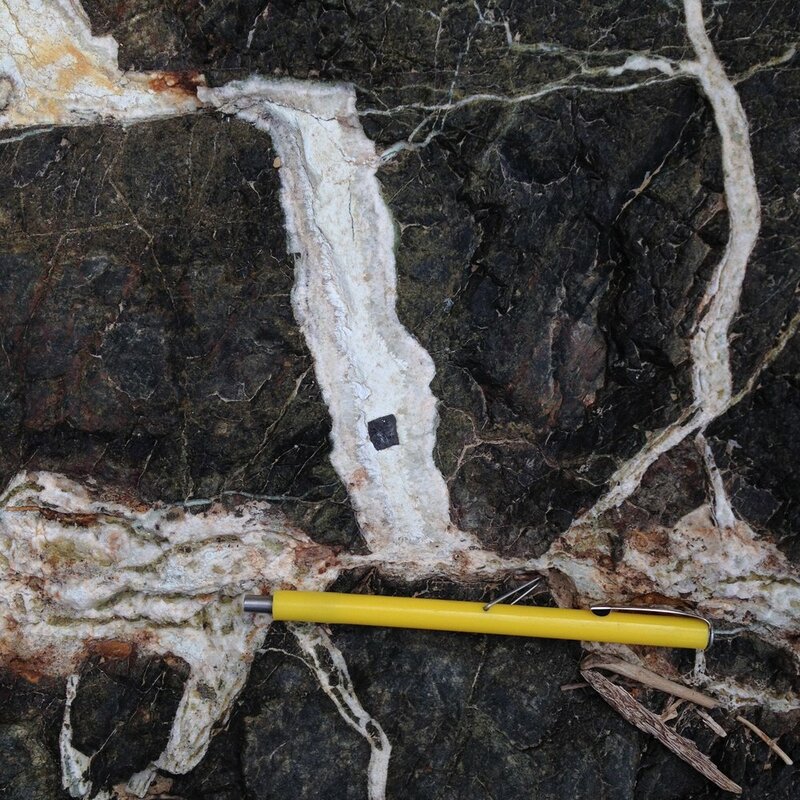 Serpentinites contain distinct geochemical fingerprints based on the melt history of the peridotite, and the composition of the serpentinizing fluid. I use a combination of major, trace and stable isotope geochemistry to investigate the tectonic setting of serpentinization. I am particularly interested in the mobility of uranium during serpentinization, and signatures of seawater alteration. 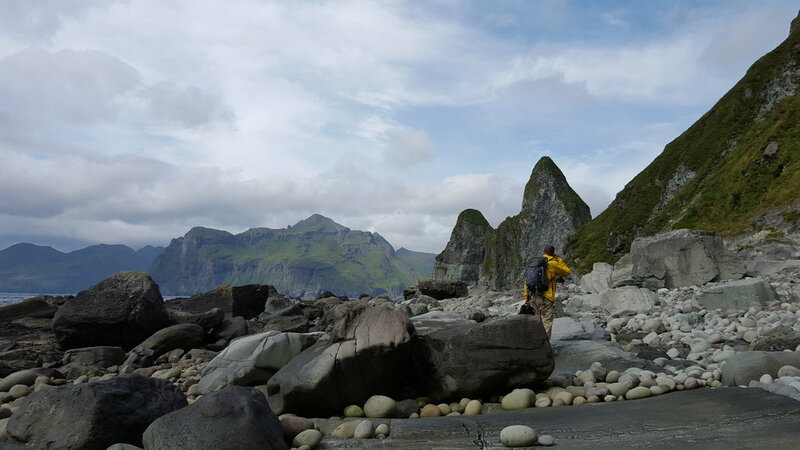 Together with collaborators at Columbia University and University of South Carolina, I participated on a 2015 GeoPRISMS field campaign to carry out the first extensive sampling on the Central Aleutian Islands of Atka, Unalaska and Umnak since the 1980s, and one of the first to specifically focus on the plutons and coeval, pre-Holocene volcanic rocks. These samples provide a unique opportunity to address the timing of arc uplift by determining the exhumation history of intrusive rocks across the region. I will use (U-Th)/He thermochronology techniques, particularly multiple chronometers with different temperature sensitivities within the same sample, to constrain exhumation rates and to estimate erosion rates over time.